Very little is known of our Peters' Prussian history, apart from the names of several ancestors and the place of their residence. With time, perhaps more will become known. The first ancestor of note, and about whom much is known, is Daniel D. Peters, 1794 - 1879. One of his descendants, Herbert D. Peters, published a brief history and a genealogy in Saskatoon in 1998. Daniel D Peters had a large family, and his descendants number in the thousands. Herbert Peters' genealogy is a 450-page book, which is evidence of this fact. The story of Petersdorf, found here on this site, takes our family's story to 1894. It was in that year that Paul Daniel Peters, 1872 - 1953, married Helena Rempel, 1873 - 1951. Both were born in Yazykovo - Paul in Petersdorf and Helena in Nikolaifeld. Soon after their marriage, they must have moved to Gnadental, Baratov, since all their children, starting in 1897, were born in Gnadental. Here they lived until the events of the Revolution and Civil War, when they joined the Gnadental group of emigrants, organized by Reverend Jacob J. Klassen, and migrated to Canada. Reverend Jacob J. Klassen had a strong premonition of the end to their religious freedom and looming hardships on the horizon. On July 13, 1923, a group of 756 emigrants, including 206 men, 211 women, and 339 children under the age of sixteen, departed for Canada. Only a small number decided to remain in Gnadental. They travelled by train to Libau, Latvia, and then by CPR ship (SS Bruton) to Southampton, England. After a two-day stopover to refuel and to take on more passengers, the SS Bruton sailed for Canada, arriving in Quebec City on August 17th. It was on the Atlantic crossing that Margaret Peters was born to Daniel P and Maria Peters; she was given the name 'Bruton' as middle name. From here, they travelled westward by train, arriving in Winnipeg, where the large party of immigrants went their separate ways. 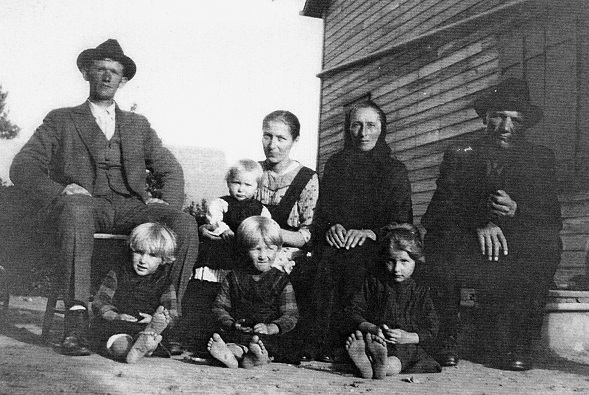 The Peters family was part of a group of families destined for a small village in S.W. Manitoba - Blumenort - where they would be part of the nucleus of a new church on the prairies.